When I first arrived in Ireland, I remembered the bucolic countryside and friendly people from a previous visit and naively assumed that it translated into an appreciation for animals and their welfare. Unfortunately, this is often not the case. Many animals here are seen as a commodity, only valuable while they are making money, and discarded when they are not. 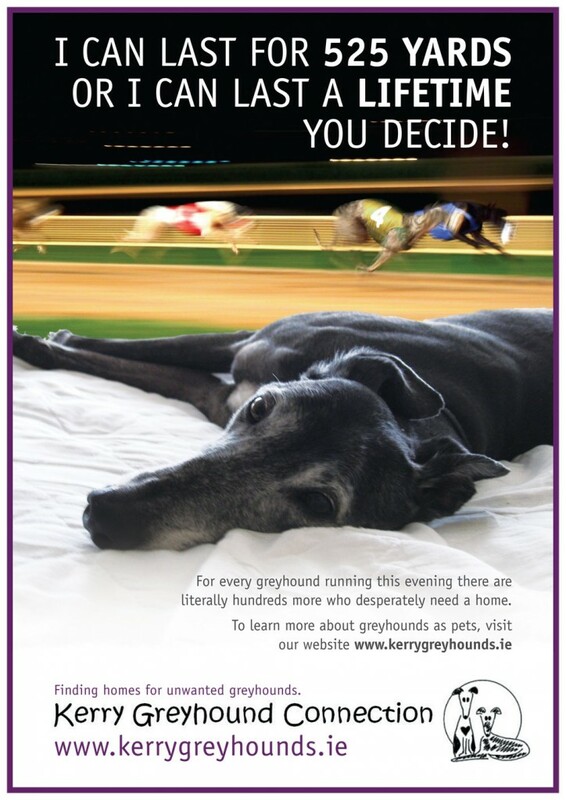 Irish racing greyhounds are a perfect example. The industry is still quite popular here, despite declining in other areas of the world, and thousands of dogs are bred every year, with only a small percentage making it to the racetrack. Having been involved with retired racing greyhounds in North America since I was a child, I was familiar with the welfare concerns associated with the industry, but the situation in Ireland is worse in many ways. The biggest hurdle facing the small independent rescue groups here is the public perception of the breed, who see them as aggressive, high energy and not suitable as a family pet. Dogs in particular are classified as either ‘working’ or ‘pets’ and the two categories don’t usually mix. While staying in Killarney a few years ago shortly after moving to Ireland, I volunteered my design services to a local rescue, Kerry Greyhound Connection, and I met the hard working group for the first time. From them, I learned more about the state of racing in Ireland and how so many dogs are destroyed, mutilated or abandoned at the end of their careers, and the huge challenges facing rescues with limited resources. I also met some of the dogs while helping with group walks down at the kennel, and they were as gentle, sweet natured and friendly as any I had known in Canada, their reputation for aggression here based mainly from muzzled dogs seen on the track, which many people assume makes them ‘vicious’. I have since become much more involved with the rescue, (now called HUG – Homes for Unwanted Greyhounds) including adopting my own dog Bella from them, and there will be plenty more about them in the future!